WELCOME Showcasing our new collection for 2016, we are excited to introduce brand new products into our kettles, toasters, catering and coffee ranges. We have refreshed our colour palettes for the Classic Toaster range, making it easier for you to select the perfect shade to match your kitchen interior, be it bold, pastel or neutral. Studio by Dualit™ is a brand new range of kettles and toasters. Featuring the stylish, modern designs and innovative technology apparent in our existing Classic, Architect and Lite ranges, Studio by Dualit™ is available at our most affordable prices yet. There are several new additions to our range of coffee machines, including the new, patented Dual-Filter Cafetiere, perfect for ground coffee or leaf tea. The popular Espress-auto has been relaunched as a 4 in 1 Coffee and tea machine, with new temperature boost button designed especially for use with tea capsules. Lusso™ and Lusso™ Cino capsule machines are new to the range, compatible with Dualit and Nespresso®* pods to give you unrivalled choice. The Cino™ Milk Steamer is the latest product in our catering range, but is compact and stylish enough to look good in a home kitchen. If you love practising your barista skills then this is the machine for you! Have you tried our range of gourmet coffee capsules? We have improved NX® Coffee Capsules with a new, sealed capsule design that keeps the coffee inside fresh whilst reducing the packaging material by 60%. ** You can find NX® Coffee Capsules in supermarkets, on the high street and order them from our website – what could be easier? By the 1960s the company was in new premises on the Old Kent Road, London. The commercial toaster was already well-established in catering circles. Founder Max Gort-Barten’s first product, a dual-light electric fire, inspired the Dualit name. His flip-sided toaster was patented in 1946. In 1952 he designed a new commercial six-slot toaster which bears a significant resemblance to today’s Classic Toaster. The 70s saw the commercial toaster move into mainstream consumer markets. EXPLOSION IN DEMAND Enhanced versions of the original toaster had now gone worldwide, and sales quadrupled overnight. Dualit started to broaden its horizons and move into new products. The company outgrew its home in the Old Kent Road, and moved to West Sussex. The product range extended to blenders and Lite toasters. In the 90s, product launches and awards came thick and fast, and the new patented ProHeat® element won Dualit a Millenium award. Dualit’s reputation amongst professional chefs is as strong today as it’s ever been. The company remains dedicated to developing great products for kitchens everywhere. BRITISH DESIGN & ENGINEERING The spirit of innovation is the Dualit keystone. Since 1945, we’ve ceaselessly invented, created and pushed boundaries. We’ve never stopped listening to our customers and our aim to bring you products that combine reliability, performance and enduring design is unchanged. Every step of our manufacturing process must pass through our stringent quality control measures. Our products are built to last and we take great care to ensure that they do. SMALL DETAILS MAKE A BIG DIFFERENCE We’re proud of our in-house research and development team and extensive engineering expertise. We want to offer our customers something they can’t find anywhere else and we spend years refining the details to make your kitchen a happier place to cook. We believe in our designs and have an increasing list of patents to show that our products are truly unrivalled. LOOK FOR OUR PATENTED ICON, FOUND THROUGHOUT THIS BROCHURE Constant product innovation is not only the key to Dualit’s success but it’s what inspires us. A patent protects an invention, preventing anyone else from reproducing, using or selling what we have worked hard to achieve, keeping it uniquely Dualit. Great British breakfasts TOASTER & KETTLE COLLECTION It’s all about colour in 2016 and we are introducing three colour palettes for the Classic Toaster Collection - Warm & Timeless, Serendipity Accents and Clean & Calm. The Architect range has new designer panel packs by bluebellgray and Charlene Mullen and we introduce the new Studio by Dualit™ kettle and toaster range. The groundbreaking multi-patented Classic Kettle has a patented replaceable element, Whisper BoilTM and anti-wobble base for a kettle that really lasts. The Classic Toaster is fitted with a patented armour-plated replaceable Proheat速 element and is the perfect partner for the Classic Kettle. Dualit’s patented ProHeat® elements are the key feature of the Classic Toasters. Their unique, armour-plated design protects the filaments from damage, whilst the extra ‘winds per square cm’ ensure that the bread is toasted more evenly. The durable protective film keeps the filaments clean and makes our ProHeat® elements virtually unbreakable. No element has as many ‘winds per square cm’ as Dualit’s ProHeat® element – this makes for the most evenly toasted bread. ProHeat® elements are replaceable to ensure minimal disruption to service. We are proud that every Classic Toaster is handmade in the UK by our skilled craftsmen. Quality and attention to detail are paramount, which is why each product carries the makerâ&#x20AC;&#x2122;s mark. A blend of neutral darks and warm lights. Deep, raw colours for a sophisticated kitchen. Pastels, greys and dusky darks. For kitchens that need to be right on trend. Small, strong hits of colour that stand out. An easy way to update and refresh a kitchen. With a sandwich cage your toaster becomes so much more! Not only can you make crunchy, melt-in-the-middle toasties without losing the filling, but it is ideal for toasting smaller items such as crumpets, muffins, waffles, teacakes and even homemade garlic bread. The Classic Kettle combines the latest patented innovations with quality and a ttention to detail to add a stylish s tatement to any kitchen. The Architect range offers a design classic for contemporary demands. Blending the technical, the practical and the aesthetic. Available with interchangeable panels. Itâ&#x20AC;&#x2122;s easy to transform your Architect. Watch the video to inspire your next colour combination. INTERCHANGEABLE COLOUR PANELS The Architect range offers no-compromise quality, flexibility and style. With innovative interchangeable panels, you can select and swap shades for your toaster and kettle according to your mood. For house moves, renovations, or even just your latest colour craving. TOASTERS Dualit’s ARCHITECT Toasters combine ergonomics and aesthetics in a brand new way. With our trademark longevity and functionality, you’ll be toasting what you like, how you like it. With a wide variety of colours and designs, transform your Architect in seconds. Check on your toast by manually lifting the lever, without interrupting the toasting cycle. Tackles bagels or buns effortlessly and defrosts straight from the freezer. 36mm slots accommodate thicker slices and tasty toasties with the Sandwich Cage. 1.5L KETTLE Everything about Dualit’s ARCHITECT Kettle is cool and collected. It’s quiet, it’s quick and it’s got a whole new look. Resilient and stylish, our ARCHITECT Kettle makes boiling water an art form. Unique drip resistant pouring prevents any water from dripping onto your kettle or work surface. Our powerful 2.3kW element brings water to boiling point super fast. Our cup level indicator window lights up a deliciously cool blue whilst boiling. LITE TOASTER & KETTLE Boasting Dualitâ&#x20AC;&#x2122;s signature style, the Lite Toaster is thoughtfully designed from the automatic pop up, to the removable crumb tray. LITE TOASTERS PATENTED PERFECT TOAST TECHNOLOGY: Calculates each variable of your toaster, from room and toaster temperature to how many slices it has toasted or how long it has had to cool for perfectly consistent, golden brown toast every time. Dualit’s Perfect Toast Technology is the ultimate in precision control. Check on your toast by manually lifting the lever during the toasting cycle, then drop it back down, without interrupting the timer. 36mm slots accommodate thicker slices and terrific toasties with the Sandwich Cage. Every Dualit kettle has a specially designed spout, with contours that ensure spills are a thing of the past. JUG As stylish as it is functional, Dualit’s Jug Kettle offers an upright format kettle with a smooth pouring action. With handy cup size indicators, you’ll always boil just the right amount. The hinged easy-fill lid even has a large heatproof knob with finger guard to prevent burning. DOME Dualit’s Dome Kettle offers a traditional kettle shape with truly modern functionality. Styled in sleek stainless steel, with chrome panels on the heatproof ergonomic handle and sturdy base, it also has useful cup size indicators to ensure you boil no more than is required. TOASTER & KETTLE Studio by Dualit速 is an exciting mix of modern design and innovative technology at an affordable price. Thoughtfully designed, with great toasting and easy pouring in mind. TOASTERS Crunchy, golden-brown toast made in a toaster that as well as being functional and easy to use, will appeal to those who like the most on-trend appliances in their kitchen. Consistently golden brown toast is a must and each toaster must pass Dualit’s famous ‘Crunch Test’ to ensure the toast it produces is crunchy on the outside, soft and fluffy on the inside. 1.5L KETTLE Featuring revolutionary, patented Sure Pour™ together with a modern style that observes the latest interior design trends. Dualit are experts at making kettles and the Studio by Dualit™ Kettle is no exception. This revolutionary feature combines an easygrip handle, precision engineered non-drip spout and lightweight polymer construction with low pouring angle ideal for anyone looking for a kettle that is easy to handle. NEUTRAL WRIST ACTION: A reduced pouring angle of just 60o compared to a market maximum of 92o. FLAVOUR, CHOICE, CONVENIENCE TEA & COFFEE COLLECTION DUALIT & NESPRESSO® COMPATIBLE* Our patented tea & coffee capsules and ESE pods provide the perfect solution for mess free convenience, exceptional taste and for excellent results every time. We use the finest coffee beans and tea leaves, carefully sealed in individual servings. Nespresso trademark is owned by Société des Produits Nestlé S.A. EXCEPTIONAL CAPSULES Dualit has taken a holistic approach by producing both capsules and machines with our expert engineering, so you can enjoy the perfect cup of coffee or tea. Our exceptional tasting Fairtrade NX® Coffee Capsules have seen UK sales grow by 71% (up on previous year, financial year 2014/15). Try the NX® range and our two indulgent single origin blends from the world’s finest coffee producing regions, all in space saving boxes without excess packaging. Join the Teavolution™ with our patented Fine Tea Capsules! Enjoy great tasting, mess-free tea in seconds. Did we mention it is award-winning and perfect every time? DISCOVER OUR CAPSULE LOYALTY CLUB AND ENJOY REWARDS WITH EVERY CUP Great news for coffee and tea capsule lovers! Dualit has launched an exclusive club offering rewards with capsule purchases - collect 10 stamps and receive 50 capsules free. Benefit from simple ordering, quick reordering, access to specialist Barista articles and be the first to know about club exclusive offers. Dualit engineers are obsessed with perfection, undertaking rigorous testing to ensure the best capsules. Our patented NX® Coffee Capsules deliver the perfect crema, rich flavours and enticing aromas and are compatible with Dualit’s range of multipatented beverage machines and all domestic drop-through Nespresso®* machines. Offering sophisticated blends and Single Origin coffees from Fairtrade beans to tantalise the taste buds. SEALED FOR COFFEE FRESHNESS DEDICATED TO QUALITY: Our gourmet coffee blends use only the finest Arabica and Robusta beans that have been carefully selected by expert Q Grader coffee tasters. Five indulgent 100% Fairtrade coffee blends sourced from farmers around the world. Our strong and full bodied Intense Espresso h as notes of roasted nuts, molasses andan indulgent dark chocolate finish. Our dark, yet balanced Classic Espresso has notes of roasted nuts and honey with a gentle bitterness and generous, sweet chocolate finish. Our Decaf Espresso delivers delicate strength with notes of sweet, nutty caramel and soft citrus sharpness. Dark roasted espresso that has notes of fresh toast and indulgent dark cocoa with a long lasting, subtle spicy finish. Bold yet creamy espresso that has notes of velvety milk chocolate and tropical fruits, with a malty sweet finish. Introducing our revolutionary, multi-patented tea capsules. Dualit and Nespresso®* machine owners can finally enjoy a range of exceptional tea blends and infusions sourced from the finest gardens. Dualit’s taste-boosting breakthrough extracts an explosion of flavour in seconds due to patented capsule technology. Enjoy tea in seconds; mess-free and perfect everytime. Patented technology releases the finest flavour from the tea leaves and reduces brew time by up to 90%. Experience tea like you’ve never tasted it before. CHOICE & CONVENIENCE: Enjoy a range of premium tea blends and infusions in the mess-free convenience of a capsule. PERFECTION IN A CUP: Patented microfiltration gives an exceptional taste and unsurpassed clarity. Each capsule is individually foil wrapped to lock in freshness. Exceptionally luxurious & smooth tea, brewed in seconds Hand plucked unique blend from the highlands alongside the East African Rift Valley. Awaken your senses with its bright golden colour, exceptionally luxurious and smooth taste. Quintessentially refreshing & elegant tea, brewed in seconds The quintessential British premium blend of black tea; a delicately flavoured, distinctive yet aromatic flavour with zesty bergamot. This is a refreshing and elegant tea that can be drunk with or without milk. The perfect blend for an indulgent afternoon tea. Naturally pure & delicious tea, brewed in seconds Experience the remarkable freshness of our Green Tea. This light, smooth, clean-tasting tea is rich in antioxidants. High quality, hand plucked and non-fermented leaves give a superior flavour. An irresistible, velvety infusion bursting with lively fruit flavours. Gentle pressure extracts a mouth-watering explosion of sumptuous blackcurrants, hibiscus, rosehips and blackberry leaves, with a hint of liquorice, which is naturally caffeine free. Refreshingly soothing & uplifting, brewed in seconds A classic digestif known for its revitalising benefits and naturally caffeine free. Made from 100% peppermint leaves, this is both soothing and uplifting with unparalleled freshness. Each ESE Pod is carefully composed of 7g freshly roasted ground coffee encapsulated in a convenient coffee pod. Coffee connoisseurs will appreciate the rich aroma and fine flavour. Perfect for that first morning coffee, New York Breakfast Blend is a medium dark roast made from 100% Arabica beans. A well-balanced after dinner coffee, combining only the finest Arabica and Robusta beans. Perfect for rounding off an eveningâ&#x20AC;&#x2122;s entertaining. This blend of decaffeinated Arabica and Robusta beans combine to create a luxuriously silky coffee that can be enjoyed at any time of the day. Prepared from a pure blend of Arabicas. Milano Dark Roast provides a shot of intense flavour. For the perfect espresso, combining Arabica beans with just a touch of Robusta. Signature Espresso is a strong bodied and delicious, liquid velvet coffee. THE PERFECT HOME CAFÉ BEVERAGE MACHINE COLLECTION Whether you prefer classic English Breakfast tea, a frothy cappuccino or hot coffee “on-tap”, Dualit has the products you need for the perfect cup. View our complete range of tea and coffee machines and accessories, including the new Dual-Filter Cafetiere. COFFEE & TEA MACHINE The ultimate kitchen cafĂŠ experience with a 4 in 1 beverage system and temperature boost. Create indulgent frothy coffees and refreshing teas at the touch of a button. Unique, dedicated tea function with temperature boost for a hotter cup of tea. With a manual temperature reduction option ideal for Dualit’s Fine Green Tea or Infusion Teas. Intuitive beverage machine with automatic dose control. Your touch button barista also has a programmable dosing memory that recalls the size of your favourite cup. Manual temperature reduction option ideal for Dualit’s Fine Green Tea or Infusions range. Like your coffee that bit hotter? Adjustable temperature settings allow you to make it the way you like it. With Dualit’s patented Pure Pour® technology, coffee connoisseurs become instant baristas. Watch the smooth streams of coffee create the perfect crema. THERMOBLOC HEATING SYSTEM: Works like a combi-boiler to provide hot water and steam on demand, for continuous cappuccinos. The result? Less waiting time, more drinking time. CAPSULE MACHINE Convenience with exceptional tasting coffee and tea at your fingertips. Compatible with Dualit and Nespresso速* capsules, the possibilities are endless. Why settle for coffee when you can have it all! Dualit Lusso™ is compatible with Nespresso®* capsules as well as Dualit Fine Tea capsules and NX® Coffee Capsules. Choose between an espresso or lungo dosage or create your own; with Lusso’s™ programmable dosing memory you can adjust the extraction volume to your preference. Thermobloc heating provides hot water on demand, light illumination and beeps when ready to use, auto turn off after 9 minutes and a soft close lever. Endless freedom of choice from patented NX® & Fine Tea Capsules, mess-free ESE Pods and luxurious ground coffee. A compact counter-saver for the most stylish kitchens, from the petite to the deluxe. Delivers touch-button espresso, with an aromatic, dense crema that baristas envy. Dualit’s cordless Percolator is the perfect coffee machine for large parties. It provides up to 10 cups of coffee in just 10 minutes, and then keeps the rest hot and ready to drink for another 35 minutes. With on/off button functionality and automatic off after 45 minutes it’s a kitchen must have and stylish enough to take straight to the table. Patented dual speed motor quietly makes heated milk, frothed hot milk, or cold froth, all at a press of a button. The patented removable whisk uses magnetism to give a fully sealed drive. Completely smooth non-stick interior = extremely easy cleaning. Stylish cordless jug switches off automatically when it reaches the perfect temperature. Dualit’s Milk Frother in sleek stainless steel is styled with a spill-free spout. COFFEE GRINDER Dualitâ&#x20AC;&#x2122;s Burr Grinder produces consistent ground coffee every time, preserving the maximum aroma of the bean through faultless temperature control. Convenient portion selector delivers only what you require each time, ensuring your beans are a lways freshly ground. Covers all your coffee equipment needs, whether coarse (for percolators and cafetiĂ¨res), medium ( for filter machines) or fine (for espresso makers). At 450rpm, our Conical Burr Coffee Grinder spins slower than other grinders. This minimises heat, preserving the natural oils and aromas released during the grind process. The powerful burrs crush the beans evenly, instead of cutting them, resulting in better flavours and a uniform grind. Removable burrs for easy cleaning. Milk Frothing Jug, Chocolate Shaker and Thermometer - everything you need to make your perfect coffee a work of art. MILK FROTHING JUG Create coffee shop quality cappuccinos and velvety smooth lattes. YO U R KITCHEN A S S I S TA N T FOOD PREP COLLECTION For cooking, baking and healthy living, Dualit can help you get the most out of the time in your kitchen. Create your own meals, bakes, juices and smoothies with ease and know exactly what you are eating. How to get your 5 a day It is recommended we eat between five and seven portions of fruit and vegetables a day; how many do you eat? Increase your intake of fruit and vegetables the easy way; itâ&#x20AC;&#x2122;s so much easier to drink fresh vegetables rather than eat them! The powerful 1000W motor and VortecS multi-dimensional mix action makes light work of the toughest fruit and vegetables; the asymmetrical fins and six pronged blade blast the ingredients, breaking down the skin, seeds, nuts and pulp in seconds to release the nutrition locked inside, creating the smoothest liquid packed with nutrients. With a generous 85mm feeding tube, whole fruit and vegetables can be juiced in seconds, without the need to pre-cut. The extra capacity juice jug and large pulp container lets you juice continuously without stopping to empty. Each bowl and attachment is dishwasher safe, so less of your time is spent cleaning. The two-stage extraction process first juices the fruit, then the remaining pulp for maximum juice yield. Adapts the juicing speed depending on whether you are juicing hard or soft fruits. Each bowl and attachment is dishwasher safe. Less time cleaning, more time juicing! We have joined forces with one of the UK’s best known chefs to create a selection of mouth-watering recipes, perfect for dinner parties with friends. If you want to learn how to cook like a professional, watch our “How to…” videos and master your skills with an expert. A six-pronged blade, internal fins and 700W of power force ingredients into the chopping zone to create the smoothest mixtures. Fruit and vegetables are given a power blast that releases the nutrition locked inside the pulp, skin and seeds. For heavy mixtures and solids to create the smoothest soups, smoothies and baby food. CHOPPING BOWL Chops everyday ingredients in seconds and creates dressings, dips and sauces. Mixes cream, egg whites and cake batter to create the lightest sponges, meringues, soufflĂŠs and mousses. The sealed drive allows you to keep food in the bowl throughout the recipe. This clever and versatile feature retains the integrity of the food being processed without pulverising ingredients. Maximum capacity for processing liquids, mixing dough & beating eggs. Use for chopping, slicing and grating smaller quantities. Sit inside the medium bowl and use for dips, sauces, baby food and herbs. Ideal for grating hard cheeses and shaving chocolate. Adjustable function for slicing various thickness: 0.5mm - 7.5mm. Select fine or coarse side for shredding in two sizes: 1mm & 3mm holes. Use for emulsifying liquids or whisking egg whites. Quick preparation for stir-frys and salads. Perfect for making bread dough and pastries. HAND MIXER Be star baker everyday! The 400W motor includes multiple speed settings - ideal for any task from whisking eggs to mixing dough, taking the chore out of baking. Small but perfectly formed with a retractable cord and cleverly designed integral plug storage, creating less clutter and ensuring storage is minimal. Use this for light and fluffy mixtures; whipping cream or whisking egg whites and meringues. Mixes dough for bread and pastry with minimal effort at slow speed for the best results. Perfect for mixing up cookie doughs and cake batters, liquids and creaming butter and sugar. Perfect for small kitchens, caravans and boats, cooking for one or additional oven space in a busy kitchen. Small in size but with a generous, 18 litre capacity. Defrost, grill, bake and convection functions will help you extend your menu even if you’re short on kitchen space. With a large, easy to read dial featuring Kg & lbs, an oversized steel bowl & shatterproof fascia. YOUR COMMERCIAL KITCHEN CATERING COLLECTION With our roots firmly established in the world of professional catering products, we have built up more than 70 yearsâ&#x20AC;&#x2122; experience of designing, engineering and manufacturing powerful products that meet the needs of professional chefs. 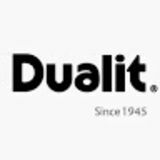 Whether you are looking for traditional soup kettles, modernstyle panini grills or waffle irons, Dualit has a wide range of commercial products for your kitchen. Not forgetting we are experts at making toast; our range of toasters include contact toasters, conveyor toasters, the traditional pop-up and of course, our iconic Classic Toaster. No element has as many ‘winds per square cm’ as Dualit’s ProHeat® element – which makes for the most evenly toasted bread. CATERING POP-UP TOASTER Unique patented ProHeat® elements have a protective armour plated layer covering the filament making them virtually unbreakable. It couldn’t be simpler: drop in the bread and lower the lever. The toast will automatically pop-up, browned to perfection, when ready. Designed for continual, day in, day out use. However, if wear and tear eventually take their toll, virtually every part can be replaced. Available in double or triple slice width, these hard working toasters can produce 360 – 500 slices of toast per hour. Radiant Quartz Red Heat elements heat up in 5-10 minutes. Thermostatically controlled elements maintain the toasting temperature by cycling on and off when the toaster is idle, saving up to 20% on energy consumption. A ‘stand by’ mode saves 75% energy. Individual element selectors enable toasting bread, buns and bagels on one side only. Other features include variable browning control, a safe load-up area and heated holding area. Contact Grills play an essential role in the kitchen, useful throughout the day. The Dualit range includes the panini and a double grill for versatility. All have flat base plates and ribbed top plates for faster cooking time…because we know time is money. Makes delicious, sealed toasted sandwich triangles; their deep non-stick moulding and robust seal means that fillings can be extremely generous. The two hotplates can be operated individually to conserve energy. Makes two rings of perfectly dimpled waffles, divided into four portions. Made from satin finish, top grade stainless steel, each plate has two layers of nonstick coating. The two hotplates can be operated individually to conserve energy. At Dualit, we know that soup is a staple ingredient of many catering operations. From the 6L wet-heat steel finish kettle to the 11L wet and dry ‘workhorse’, our range of soup kettles are perfect behind the scenes or out on show. CINO MILK STEAMER No more delayed hot drinks orders or waiting to use the steam wand on the coffee machine, the Dualit Cino™ Milk Steamer will change the way your coffee service is run. The Cino’s simple sleek stainless steel design means it will also be a great addition to your café, B&B, or for those who enjoy coffee shop style coffee at home. * Suitable for drop through machines only. Excluding professional machines and ‘built in’ models Nespresso® trademark is owned by Société des Produits Nestlé S.A.